Usually, we set password to protect our private or sensitive information from others’ eyes. But sometimes we found ourselves being locked out as forgetting the password. This can be a troublesome thing frustrates people. 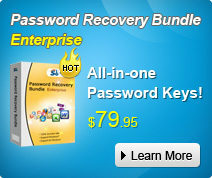 This article introduces several methods we commonly used to recover password. Sometimes, the password can be recovered instantly. This is only possible if the password protection is very poorly implemented. The example is MS Access. Any password for an MS Access document can be recovered instantly no matter how long it is. Sometimes it is possible to create a “fake password”. It is different from the original password (and it usually looks quite odd), but it can be used instead of the original password. You can use it to remove the protection from the document or to change the existing password. Brute Force Attack is the most widely known password cracking method. This attack simply tries to use every possible character combination as a password. To recover a one-character password it is enough to try 26 combinations (‘a’ to ‘z’). It is guaranteed that you will find the password. The longer the character set is, the longer the required period of time is. Dictionary Attack uses a dictionary. Password Crackers will try every word from the dictionary as a password. A good dictionary (also known as a word list) is more than just a dictionary, e.g. you will not find the word “qwerty” in the ordinary dictionary but it will surely be included into a good word list. Indeed, this combination of characters is commonly used as a password. Dictionary Attack is usually quite fast. Noticeable delays are possible only if the dictionary is very large. However, the password can be recovered only in case it is present in the dictionary. The probability that this assumption is true is not, in fact, high. Nevertheless, since Dictionary Attack doesn’t take much time, it is recommended to try it before proceeding to the slow Brute Force Attack. These five methods are the most commonly used to recover password, and Instant Password Extraction, Brute Force Attack and Dictionary Attack are commonly applied to password recovery software such as Password Recovery Bundle Standard. If I forgot my Yahoo email password, which method you mention in your article can I use to recover my password?